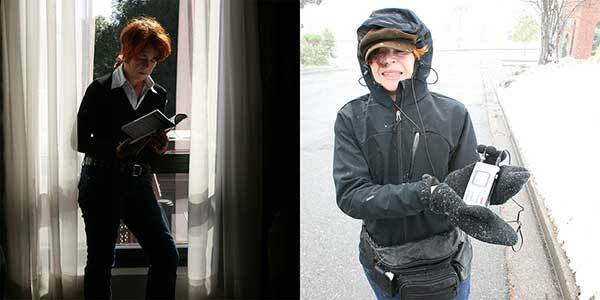 Inter-disciplinary artist, writer and educator Valerie LeBlanc (b. Halifax, NS) has presented throughout Canada, the United States, Europe, and Australia. Her creations travel between poetry, fiction, performance, visual and written theory. Valerie has been creating video poetry since the mid 1980’s. In 2011, she screened her video poem: The Renovation, during her presentation at the Ruins Conference, Senate House London, UK. In 2012, she published the play: The Raft, through Basic Bruegel Editions. Also in 2012, LeBlanc brought the MPB Street / Screen Encounter to Eyelevel Gallery’s World Portable Gallery Convention, Halifax, NS. Creating the MediaPackBoard (MPB) portable screening/performance apparatus in 2005, LeBlanc has used the device as impetus for events involving art centers and public audiences/participators. She has also curated the work of other artists into the MPB events. This year, in collaboration with several artist/writers and editor/curator Diana Sherlock, LeBlanc released the ePub: MPB-X. This critical discourse on portability in art and art dissemination is available for free download. After beginning a Research PhD (Doctor of Philosophy in the Visual Arts) at the University of Sydney, AU in 2013, Valerie returned to Moncton, NB. In July 2014, in collaboration with Daniel Dugas, she carried out research for the project: FLOW – BIG WATERS in the Everglades National Park, Everglades, FL. Recording and researching several aspects of this unique biosphere, LeBlanc and Dugas are currently producing fictional soundwalks accessible to Park Visitors. The work is expected to be released throughout 2014 -15 and may additionally include a video installation. Originaire de Halifax, Valerie LeBlanc est une vidéaste, poète et essayiste. Cette artiste pluridisciplinaire a travaillé au Canada, aux États-Unis, en France et en Australie. Elle crée des poèmes vidéo depuis le milieu des années 1980, en favorisant le temps non spectaculaire et la beauté d’une esthétique ready-made. Elle a créé, en 2005, le MediaPackBoard (MPB), un appareil de projection mobile pour la performance. Valerie vient de publier ce printemps Living In Dangerously Smooth Times aux Éditions Basic Brugel. 2005 To Save or Not to Save? International preservation projects dealing with online art, – empyre- soft_skinned_space, http://www.subtle.net/empyre/ Participant – Feb.
2002 E lounge Discussions from the Atlantic Cultural Space Conference – Lea Deschamps, – empyre- soft_skinned_space, http://www.subtle.net/empyre/ Participant – Oct.
2008 MPB EARTH, Truck Gallery and Artcity – offsite event, downtown Calgary, AB. Emmedia-Calgary, Videopool-Winnipeg, Sawvideo-Ottawa, Atlantic Cultural Space Moncton.